Galactic war getting old? It's time to go hunting. Capturing a moment from Star Wars Battlefront 2’s Ewok Hunt mode is like staring at a low-lit snippet of an avant-garde film: A dark forest. The snap of a twig. The click of a flashlight. A laser beam cracks through the trees. A soft “yub, nub.” The blaring horn. Glowing eyes. The sharp spear. The stormtrooper cries. Ewok Hunt feels like a Zombie server mod. It’s an approachable plunge into Star Wars nerd-dom, but it veers away from the grandiosity of Galactic Assault or Heroes vs. Villains. Gone is the dull migraine of fussing over Star Card rarity tiers. It’s a relief not having to hoard battle points to grab a hero character or a ship. All that’s left is a Star Wars take on cat-and-mouse with murderous Teddy Ruxpins. After a few rounds getting acclimated, Ewok Hunt delivers the same blast of simple fun as its brother modes. Crucially, it signals DICE's willingness to find new ways to break Battlefront 2’s monotony. Ewok Hunt is an asymmetrical multiplayer mode. At the start of a round all players pile onto the stormtrooper team except for two chosen souls, who spawn as tiny Ewoks. Gifted with enhanced night sight and a footstep-tracking detection pulse, the Ewoks do their best to stealthily reprise their Return of the Jedi victory over the Emperor’s finest fodder. The troopers, equipped with a flashlight and a standard carbine, must survive the night’s fuzzy terrors until they can escape aboard a shuttle. Ewoks can respawn indefinitely, but stormtroopers respawn as more Ewoks, steadily bolstering the attacking team and reducing chances of a Stormtrooper extraction. As a trooper, the first few moments stumbling around the darkness is intense. I like how the mode pushes the importance of moving and grouping up by spacing out trooper spawns throughout the map. There’s a chilling thrill to realizing you’re the lone soldier with a spawn near the map’s edge and nobody around you—the flickering light from teammates seems miles away in the murk. That paranoia is amplified by a locked first-person view, a limited flashlight battery, and a nigh-useless radar. Even the background music is muted to accentuate every bootfall and muffled yelp of surprise. It’s easy to revel in the predator power fantasy as an Ewok, but as I quickly learned, charging into a blob of troopers isn’t the ninja teddy bear’s way. You need to use the darkness to mask your movement. Getting in close enough for a poke with the spear is a game of avoidance and patience. I get the same feeling of reward when ghosting through a tough level of a stealth game. The Ewok’s toolkit gives you a few ways to divide and conquer troopers using misdirection. I particularly enjoy the firebug sling, which lets loose a homing swarm of insects that send troopers scurrying. You also spawn in treetop villages far above your prey, which gives you options. Do you go for the flashy airdrop on a white helmet far below? Or do you keep things quiet and harass with the sling? The correct answer: creep right behind someone and blast the war horn. Every time. As in other infection-style games clumping up to survive is a basic necessity. It’s a nice change from the more selfish play in BF2’s larger modes. Still, some parts of Ewok Hunt’s single map feel weighted towards the defenders. A cave in the forest’s northern end is a popular trooper hangout thanks to the rocky roof and two easily covered entrances. Ewoks can intrude through a smaller rear pathway and drop through an upper rocky ledge, but it’s often tough to unseat dug-in Imperials trained on the choke points. Rounds often linger in a boring stalemate as the troopers wait here before dashing for extraction. The absence of voice communication and the slow responsiveness of text chat makes it hard to coordinate a decisive strike. 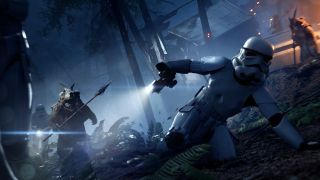 BF2’s community has been swift in clamoring for Ewok Hunt’s addition as a permanent mode. Talk turned excitedly to other Star Wars scenarios that could fit the Hunt mold, including this suggestion of a Darth Vader vs. Rebels faceoff that kind of needs to happen. The positive player response shows that you can successfully fit unusual asymmetrical multiplayer formats into a gargantuan property like Star Wars. Since launch the game’s core modes have grown stale. Galactic Assault mode flows as it did day one: team A eventually pulls ahead of team B, funds a hero chain and stomps multiple rounds with overwhelming momentum. There's little separating the 200th match on Theed from the 20th, and while BF2 excels at staging the spectacle of a Star Wars clash in full tilt, repetition has been a problem since launch. Ewok Hunt strips back extraneous fluff: no buzzing ships, no whirling heroes, no surly voiced commander berating you over the horn for another lost objective. It's just a scared squad of stormtroopers, a quiet Endor forest bed, and a bloodthirsty tribe of Ewoks. The mode doesn’t rely on the spectacle of a beautifully dressed map, instead it challenges you to outsmart other people. Maybe Battlefront 2 needs more of that to rescue its flagging worth.